This past Wednesday I had the experience of being invited to attend the Rangers 3D viewing party at the theatre at Madison Square Garden. 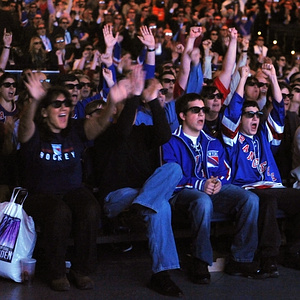 The Rangers vs Islanders game was the first sporting event being broadcast in 3D, and since no one actually owns a 3D television yet, the viewing party was pretty much the only way to take in the spectacle. Glasses were passed out to the 2000 people in the crowd, Rangers legends were on hand to host the event, NYC celebrities, the owners of MSG, cablevision, NYC media outlets, and the NHL commissioner and executives were all there to take in this potentially game changing event. And although the media would portray the 3D broadcast as a large success, I am less than convinced that 3D is the way of the future for the television industry. Before talking about the market though, let me recap my experience. It was subpar. There were of course some very cool “a-ha” moments, where the broadcast would shift down to the ice level camera and a player would be skating directly out of the screen and into you as he dug a puck out of the corner boards. But for the most part it actually made the game more difficult to watch. I’m a huge hockey fan, and anyone who watched the olympics this year knows that HD-TV hockey is a thing of beauty. Gone are the days of the casual viewer not being able to track the puck in standard definition, and Fox feeling compelled to highlight the puck with a red tail on every shot. Unfortunately, the 3D broadcast made me feel like I was back in the standard def days again. Maybe it was just because of the awkward glasses not being positioned correctly on my face, me not being centered with the viewing screen, or the half-headache-half-nauseous feeling I’d get from the 3D, but it just wasn’t as crystal clear as it was sitting in front of an HD on my couch. When HD was emerging in the late 90’s I don’t remember being aware enough of the market to make a prediction about it’s success (around age 15), but I would assume it was clearly agreed upon that HD was an improvement over SD. Anyone who compared the two side by side could tell which one looked better. Add to that the fact that the FCC was in the process of mandating television upgrades to digital enabled, and since people were buying new televisions anyway they would go with HD as soon as the costs came down. It seemed clear that HD would be prevalent in the near future. Now compare that with the forces driving 3D television adoption. The experience right now doesn’t seem like an improvement to me in the case of hockey broadcasts. Maybe the NFL or NBA could benefit from it, but I can’t imagine there’s a huge value add to watching a drama or sitcom in 3D either. The equipment is expensive ($2500 television, $200 glasses). There’s a need to wear uncomfortable and awkward glasses. The standards in the industry are not clearly defined which is a problem for production and broadcast companies. And is there really demand for this? Does anybody want this? ESPN will launch a 3D channel later this year, and it will be interesting to see if people purchase a 3D ready setup just to take this in. I’d rather save my money, and enjoy the better, easier, more relaxing experience that we currently have with HD television. One interesting area to watch will be glasses-free 3D which a number of companies are already working on. At my old startup workspace, Soho Haven, there was a company called 3D impact media which produced these. When I would walk by their demo I’d often be shocked at their content jumping out at me. I’d like to think that this tech will eventually get as cheap and effective as the glasses required version, and when it does I’d be loathe to wear the glasses again. It seems like buying a glasses required setup now would be akin to buying a remote control connected to a television by a wire shortly before the wireless remote would be released. Hold off, and make your decision after the market plays out a bit. Posted on March 27, 2010 by petkanics. This entry was tagged Predictions. Bookmark the permalink.